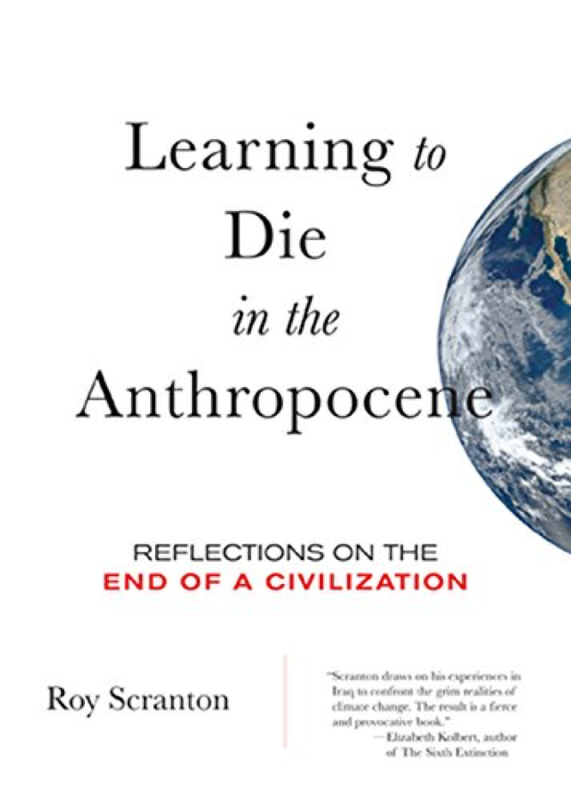 Hermetic Library Fellow T Polyphilus reviews Learning to Die in the Anthropocene: Reflections on the End of a Civilization by Roy Scranton. The short treatise Learning to Die in the Anthropocene: Reflections on the End of a Civilization is pulled together from earlier articles and presentations by Roy Scranton, but it does cohere as a single piece. I found the title irresistible: not only does it evoke the deep philosophical tradition of “learning to die,” but the indefinite article in the subtitle serves as a hopeful reminder that our civilization is not the first, and with luck, won’t be the last. Scranton is not sanguine about prospects for addressing the anthropogenic degradation of climate. He recognizes the socio-economic operations of the current global system as inherently unsustainable and incapable of effective reform. His chapter on “Carbon Politics” points up the attractiveness and the futility of protest-based efforts to inspire political change with respect to the energetic-material basis of our societies. This analysis is paired with “The Compulsion of Strife,” which traces the war and vengeance inherent in the origins of carbon politics, as well as imminent in the demise of civic structures. Finally, his “New Enlightenment” calls for an embrace of the humanities, in order to maintain the memory of the dead. If we who will inevitably die are to have a further future, it will depend on our participation with the dead in systems of culture. This sort of humanism is needed in order to transcend the fear and aggression that our networked world propagates with nearly instantaneous speed through the nodes of our individual lives. The book is bracketed by sections both called “Coming Home.” In the introduction, Scranton is coming home to the US, to witness in the devastation of New Orleans by Hurricane Katrina the same phenomena he had seen in Baghdad in the wake of Operation Shock and Awe. In the coda, he gestures to a mystical homecoming, in which we realize our identity with the fundamental mechanisms of change and perpetuation, under the figure of light.